First off, this game really reminds me of an old obscure ps2 game I had a while back called Battle Engine Aquilla. Second, this game is good, its shaping up to be fun, but its not going to be for everyone. There is a learning cliff, you either learn to climb fast or you will hate the game. I would dare say more people would dislike it than like it. But overall I have enjoyed it. The game was worth the price. Its like taking a moba and layering a very primitive rts with building construction on top. I think there is a great game here if only it was'nt so difficult,I personaly would like the easy mode to be what it says easy so we could learn how to play and enjoy what seems to be the makings of a GREAT game.if Dev is reading these posts can we have a save game option please thx. 5.You can install weapon or ability on unit. 3.space map need more unit. 4.buggy : unit stuck in the rock. This is a very unique game in fact you might actually overlook a few functions if you don't take a very quick look at the tutorial videos the Dev (who has built this game so far on his own) put up but that won't take that long. And before you know it you are having fun by using the RTS game play or maybe the 3rd person action game play with a hint of first person thrown in there or even the DOTA game play created by building a few buildings that every 60 seconds send troops of to your enemy base or in this case a Ark. 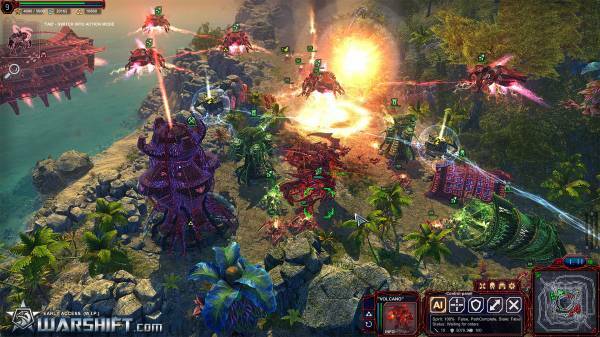 Warshift is a cool blend between a shooter and real-time strategy game. The game doesn't have much depth in AI units. For example, you can't build a tonne of different types of units and upgrading them multiple times like in other strategy games. However, the game makes up for that with the ability to directly control one of your units. 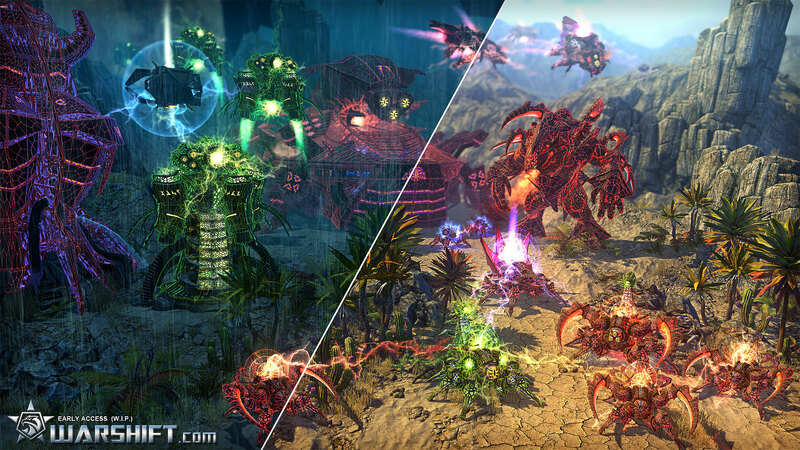 You can choose between a handful of units to control, which all play differently. These units have unique weapons, and have different abilities. These controllable units can also be upgraded. I'm trying the WARSHIFT game now on early access and I'm impressed how can one person produce all this. The art is very well done, the flow of the game is very good, the missions are quite challenging and I love the mechanics. Can't wait to play the whole thing. This guy deserved my money and I'm happy doing so! Described sections: Ground mode, Air mode, Underwater mode, Landing on the hellipad, Enter the ARK. Described sections: Ground mode, Turbo-acceleration mode, Watercraft mode, Enter the ARK. Described sections: Grounded mode, Stealth mode, Underwater mode, Enter the ARK. Described sections: Corsair basic weapons, Unguided rockets, MLRS rockets launch, Homing missiles, Cannons, Thermobaric Bombs. 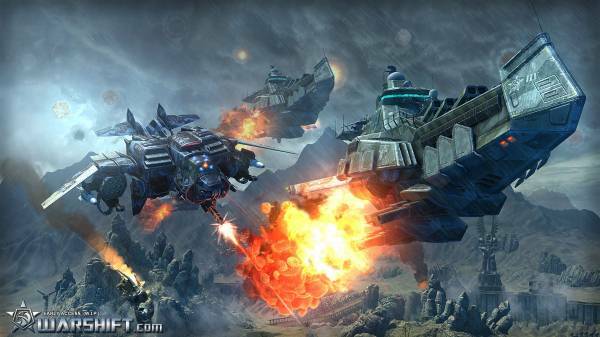 Described sections: Close-fight weapons, Long range weapons, Sudden strike, Gameplay Tips. The jet-pack is more useful for the long jumps than for long flights. But it is a very effective equipment for diversionary missions behind enemy lines. Described sections: Action-strategy mode switching, Strategy camera control, Strategy Camera moving using keyboards shortcut, Strategy Camera moving using the MiniMap. Described sections: Units selection, Units group, Units movement, Patrolling mode. Described sections: AI behavior, Defensive mode AI, Artillery mode, Close air support by air force, Bombarding using dron-bomber, Gameplay Tips. Described sections: Introduction to building process, Creating buildings, Creating Extractors and Drilling platforms, Creating Automated Factories, Creating Energy Sources. Described sections: Introduction to creating units, Creating units using the ARK, Creating units using the Automated Factories. Dreadnought management: Artillery mode, Bombardment mode, Automatic defensive systems, Launching Interceptor, Landing on the Docking Platform, Rearm and repair. 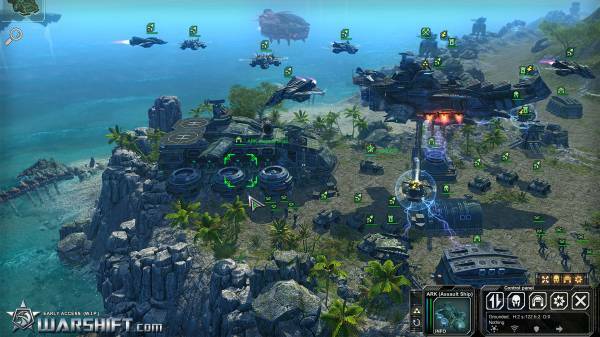 Described sections: ARK assault carrier navigation, Repair structures using the ARK, Orbital strikes. Described sections: Game map selection, Your and enemy’s teams set up, Gameplay mode types, Starting states, Logistic and supply options, Hiden enemy option, Time and weather settings. In 2062, the colonial planet “Enigma” was invaded by an aggressive alien race Atroid’s from the parallel world that has gone into our universe through the hypothetical “Gates of Chaos”. Colonial Republic did not want to risk human lives, and scientists had to create an entirely new army of intergalactic operations. The republican fleet and the assault battalion “Delta”, consisting of cyber-guards, heavy machinery and robotic drones-transformers was sent to the planet. Atroids are an aggressive non-material form of life from the parallel world that has gone into our universe through the hypothetical “Gates of Chaos”.